In all the years I have been skiing I never had a fall or crash that put me in a doctor's care until yesterday. I suppose I was overdue! A trip down one of the easier trails ended up with a major fall when my skis stuck like glue in some newly made snow. I have always been wary of the snow near the snow makers and this time I thought I was far enough away. Not so. Immediately behind me two other young ladies crashed within seconds of my crash. Many thanks for Roger Pellerin helping me to pick up the pieces. Somehow I was able to drive myself home where Nancy took me to the emergency room in at Cortland. Later I was transferred to Crouse Hospital in Syracuse for specialized evaluation. After over twelve hours in the emergency room I was discharged to go home by midnight. During this period my faithful wife Nancy held my hand and diligently prayed for me. There were hours of uncertainty and multiple tests. Fortunately the prognosis at the moment is good for my recovery. The ribs are mighty sore and my only kidney seems to be on the mend. When and if I return to the slope either this year or the next is up in the air for now. Meanwhile, I will get lots of reading and resting done. 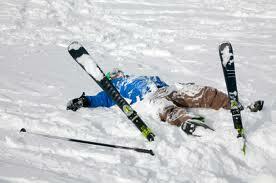 I'll be thinking about all the geezers still sliding on the slopes and wishing you safe skiing. It is ironical that yesterday I had a brief conversation with at least two geezers that had crashed last year due to similar circumstances. If I do get back to the slopes, I now have one number one rule. Not Me But How I Felt! Do not ski a slope where there has been snow making that has not been groomed. A corollary to that rule will be ski no slopes where snow making is in progress!